Baked Tortilla chips made from tortillas and a little oil. Perfect for using up leftover wraps! 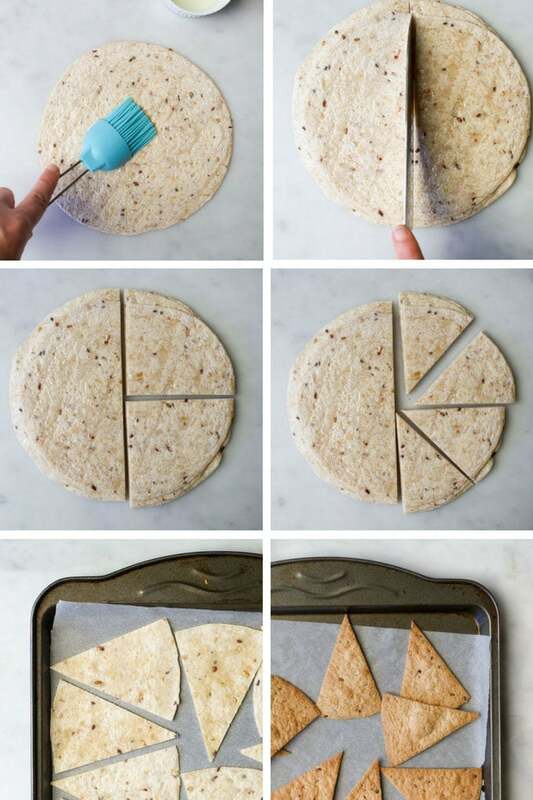 I often buy a pack of tortillas for filling and adding to lunch boxes. However, I don’t always get a chance to use them all up before they start to go stale. Cutting and popping them in the oven, to make baked tortilla chips, is the perfect solution. I have made tortilla chips with a range of different tortillas and, personally, I feel corn tortillas produce the best chip. If you are purposely going out to purchase tortillas to make these chips, then I’d recommend getting corn ones. It is worth it. However, I rarely buy corn tortillas as they are less popular here. I therefore find myself making these chips with what ever tortillas I have. Each variety produces a slightly different result but both my boys seem happy with all of them. They are just hooked on that crunchy texture that kids seem to love. Pictured above are the process steps. Start by lightly oiling your first tortilla and then stack your second on top, lightly oil it and repeat with the remaining tortillas. Cut your stack in half and then cut each half in half again and then once again. This will provide eight stacks. Pop the chips on a baking tray and bake until golden and crisp. Of course, you don’t have to stick to triangle chips. Cookie cutters are a great way to make fun shapes that kids love. As we are fast approaching Christmas, this week I decided to make some Christmas chips. 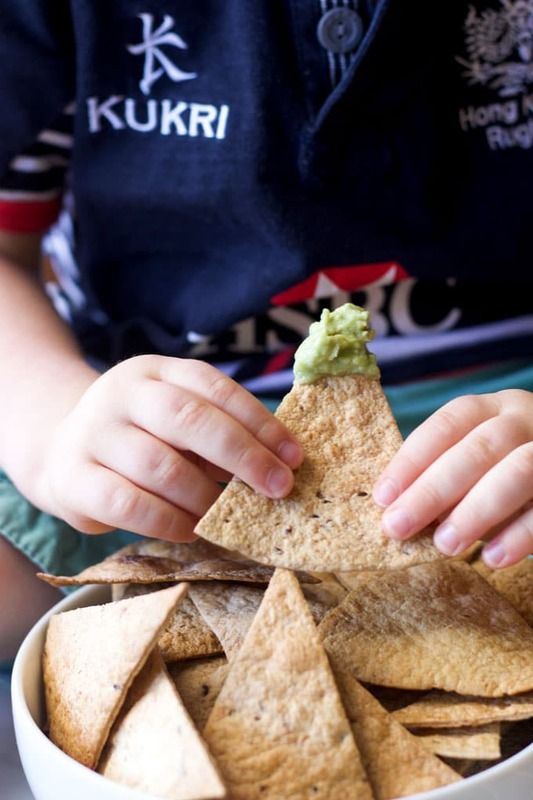 My top tips when making baked tortilla chips…. Don’t crowd your baking tray. I try not to let them over lap. A little overlapping is ok but if they are too crowded they won’t crisp up. Baking times will vary depending on ovens and the the tortillas. I recommend staying close to the oven and keeping an eye on them. Now isn’t the time to quickly hang out a load of washing (yes I am talking from experience!) The baking time will be around 8-12 minutes. Allow the chips to cool in the baking tray before serving. This allows the chips to become more crispy. Tried these? I’d love to see a picture, tag me on Instagram or Facebook. 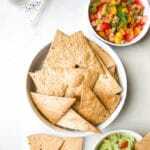 Baked tortilla chips are a great alternative to store bought chips. Lower in both oil and salt but still have that "crunch factor" that kids love. Pre heat oven to 180c (350F) and line two baking trays with baking paper or brush with oil. Brush your first tortilla lightly with oil, making sure you cover the whole tortilla. Place another tortilla on top of the oiled tortilla and again brush with oil. Repeat until all the tortillas are oiled and stacked on top of each other. Arrange the tortillas on the two trays, trying not to overlap too much. Bake for approx 8-12 mins, until the chips crisp and golden. Alternatively you can use cookie cutters to make fun shapes for the kids. See above for Christmas example. Leaving the chips to cool in the tray allows them to crisp up more. Do not skip this step! Nutritional information is an ESTIMATE only and is calculated using an online nutrition calculator. Nutrition facts will vary depending on the type and size of tortilla and also the type of oil used. These facts were calculated using wholemeal grain tortillas and olive oil. Life of a Healthy Little Foodie……. Cuteness alert! Just look at him putting the star on top of the tree. This is the first year that Rory has really got into the Christmas spirit and I have been enjoying listening to him singing Jingle Bells in his bed at night! How old are your kids and are they EXCITED? I didn’t know corn tortillas were hard to find in Australia. Interesting! 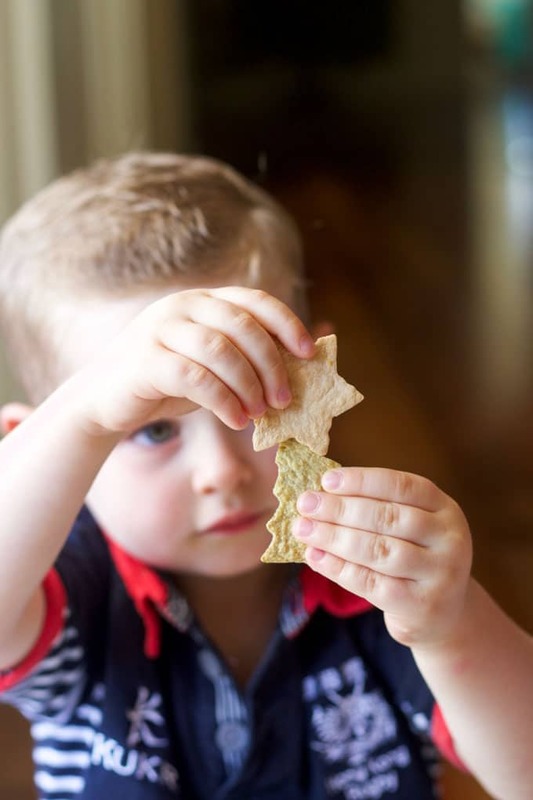 Your cookie cut out chips are so cute and what a great idea! Pretty photos too! Thank you Katie, that is probably a little misleading. You get corn tortillas here but they don’t stock them in the store I usually shop in! Love this idea! 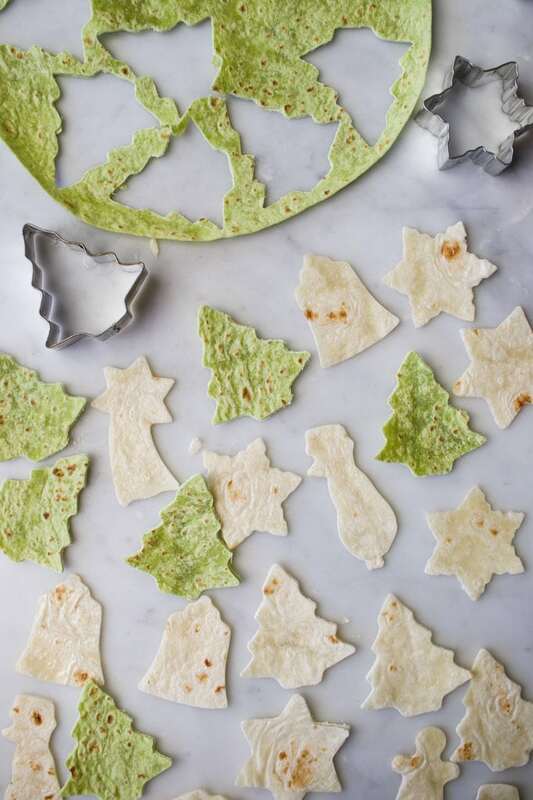 What a great way to create homemade chips… I especially love the use of cookie cutters for festive shapes! Thanks Chris! Got to love a cookie cutter to make the kids think they are getting something extra special! 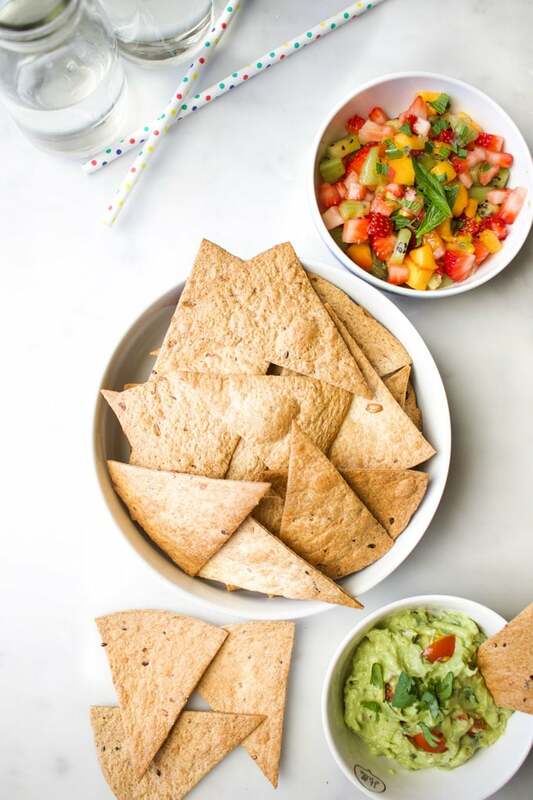 I used to bake tortilla chips all the time–now you’ve reminded me how fun and delicious it was. 🙂 LOVE your idea of cutting them up into Christmas shapes! Thanks Demeter, It is funny how we make things all the time and then forget about it. I do that with so many recipes! I really love the festive chips! They are so adorable. I need to consider making my own. I agree with everyone else, such a genius idea with cookie cutters!!! Great snack for festive season! Hi, Thanks for sharing the recipe! I’ve tried these making the tortilla at home but I have a busy schedule next month. Can I make these recipes with store bought tortillas? Thanks Jasmine, They are best freshly made but my two were happy to eat the next day.